A proper drainage system is important for any landscaping project. It can help protect your property and home and can also increase your home’s value. It’s important to explore your options for reliable drainage first, such as with french drains, dry wells or rain water storage tanks and which one suits your home best. Drainage systems protect the foundation of your home, as well as your hardscape and softscape landscaping which, in turn, beautifies your home and adds curb appeal. A good drainage system is an investment and preventive care for your home. A drainage system has benefits such as moisture control in attics and crawl spaces, as well as pest and bacterial control which often results from standing water. French drains (also called trench drains) are trenches that range in size from one foot to two feet and are typically filled with gravel, rock or other materials. French drains are versatile, and may be installed practically anywhere on the property. They are popular choices for their effectiveness at quickly removing excess water runoff. French drains are sloped which allows excess water to drain and seep into the soil surrounding the French drain away from the home. 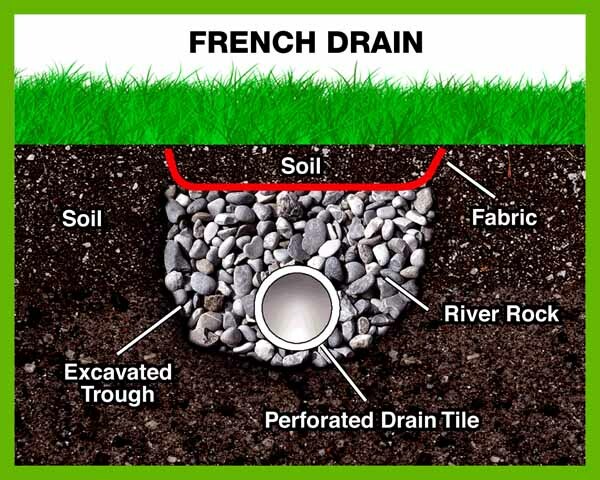 Though a French drain appears simple in design and function, it takes knowledge and experience to properly design an effective French drain. Consulting with an experienced landscape design company is crucial if you’re interested in installing a French drain. A drywell is an underground container which collects and redistributes excess water from softscapes and roof runoff. Water is collected through runoff and a drain pipe connected to the container. The collected water is redistributed to the surrounding soil through small holes in the container. The size and location of a drywell is important since you’ll need to ensure it can effectively drain unwanted water and is cost effective. A rain water storage tank is an above-ground container which collects rainwater runoff from the roof via gutters and spouts. The unique component for rain water storage tanks unavailable with French drains and drywells is that the water may be used for a variety of functions, such as water for landscaping, gardening, auto washing and more. Even though rain water storage tanks are above ground, which would seem unappealing to the observer, you may incorporate your own decorative touch such as copper rain chains. You can also make fun projects for the kids and family with different ways in which to conserve and reuse collected water. Rain water storage tanks are available in a variety of sizes and are useful in collecting a substantial amount of water with the moderate rainfall that we get here on Delmarva. If you need assistance choosing between French drains vs. dry wells vs. rain water storage tanks, contact the pro’s at F.A. Hobson Landscaping for a consultation.